What's the Greatest Self-Help Book Ever Written? Millions upon millions of dollars are spent every year on some new wave of self-help books. There isn't a month that goes by that some self-proclaiming "Guru" doesn't come out with a new book claiming to have the answer for what's troubling us. Many of these books jump right to the top of the best-seller's list because they claim to have uncovered some new method or theory to solve a particular problem or multitude of our problems. Have a financial problem? There's a book for that! Having relationship problems? There's a book for that! Having trouble with your kids? There's a book for that! In despair or lost hope? There's a book for that! There's probably a book for those who are having financial problems because they're having relationship trouble with their kids and it's causing them despair and lost hope! We could fill the rest of this page just naming topics of self-help books. Imagine if you took the time to read at least one book on every available topic. You'd spend all of your time reading self-help books! Think you have problems now? Don't you wish there was just one book you could go to to get all the answers you'd ever need? There is! Please allow me to introduce to the world best selling book. 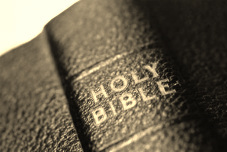 It was written by the "Greatest Author" of all time and he instructs us on how to deal with every problem under the sun. And by the way, God, the only author of pure truth created time and the sun. God's creation of a self-help book is the Bible. Self-help authors want us to believe they have the answer to all of our problems. If they are not based on Biblical Principles and Truths, God says we will be blessed if we don't take counsel from them! Some self help authors want you to believe they can instruct you better than God's Word. Psalm 1:1 Blessed [is] the man that walketh not in the counsel of the ungodly, nor standeth in the way of sinners, nor sitteth in the seat of the scornful. Psalm 1:2 But his delight [is] in the law of the LORD; and in his law doth he meditate day and night. What happens when we fall for their way of thinking? We end up in a pit of despair. God says delight in my instruction and meditate day and night for it has the power to guide your life better than you could ever imagine. Psalm 119:85 The proud have digged pits for me, which [are] not after thy law. Proverbs 5:21 For the ways of man [are] before the eyes of the LORD, and he pondereth all his goings. Proverbs 5:22 His own iniquities shall take the wicked himself, and he shall be holden with the cords of his sins. Proverbs 5:23 He shall die without instruction; and in the greatness of his folly he shall go astray. Forsake means to abandon, or turn your back on. God tells us not to turn our back on mercy and truth. The Truth, which is the Lord Jesus Christ, (John 14:6 Jesus saith unto him, I am the way, the truth, and the life: no man cometh unto the Father, but by me.) and the mercy that he provided through the shedding of his blood on the cross. Ephesians 1:7 In whom we have redemption through his blood, the forgiveness of sins, according to the riches of his grace; Ephesians 2:13 But now in Christ Jesus ye who sometimes were far off are made nigh by the blood of Christ. Mercy and truth are to be bound around the neck and displayed as a beautiful medallion. The table of our heart is where we're to inscribe everything precious. We must do these things first before we can find favor with God and man. Then we are to simply trust in the Lord with all our hearts and not think our ways are better than His. God says, it's my Word that will take you out of darkness and make your path clear. The Lord says, give me what's troubling you. Put in on me! I will sustain you! I will never let you be removed from me! The Words of our Lord cannot be any purer or become out of date! Does the Bible not begin with "In the beginning God created the heaven and the earth." and end with "I am Alpha and Omega, the beginning and the end, the first and the last. If Jesus is the beginning and the end, and we are not at the beginning or the end, then God's Word cannot be out-of-date. Are you trying to deal with problems on you own? Have you turned away from God's principles to find an easier method? Have you turned to ungodly instruction? There is no better way to get answers than searching the Scripture. 1John 4:4 Ye are of God, little children, and have overcome them: because greater is he that is in you, than he that is in the world. 1John 4:5 They are of the world: therefore speak they of the world, and the world heareth them. 1John 4:6 We are of God: he that knoweth God heareth us; he that is not of God heareth not us. Hereby know we the spirit of truth, and the spirit of error. If you need help, you can go to LBC's Blog Page for extra assistance. If you have a question, need help finding scripture, or prayer request, please feel free to inquire on the Blog Page and we will do our best to guide you! Relationship- Proverbs 5:15 Drink waters out of thine own cistern, and running waters out of thine own well.